If you've been reading this blog for a while, you'll know that Rachel is the Queen of Yard Sales (or Yard Sailing, LOL). 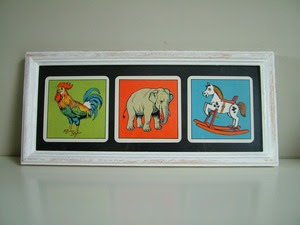 We went to a neighbour's sale this weekend and I came away with the most adorable mid century memory game for the kids! I just LOVE the illustrations! There are so many cards that I would love to be able to preserve them somehow.